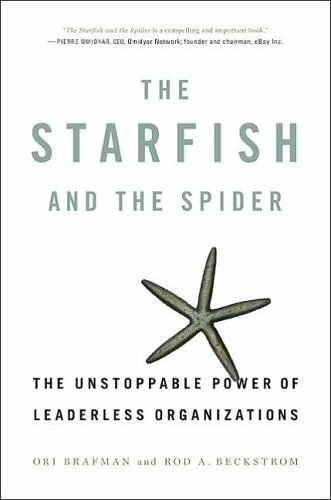 This series is focused on The Starfish and the Spider: The Unstoppable Power of Leaderless Organizations by Brafman and Beckstrom. Come check it out every Wednesday in June! The church is in crisis. United Methodist attendance is in decline, the Southern Baptists are…not baptizing, and, most importantly…google searches of God, Christian, and Bible are dropping. The sky is falling! Some would call it a failure of leadership, both on the local and national levels. But in truth, what is happening to the Church is the same thing happening to large businesses and conglomerates: we become spiders when we should become starfish. What do I mean by that? In The Starfish and the Spider, Brafman and Beckstrom write about the difference between spiders and starfish. Spiders have a head…chop off the head of a spider, and it will die. But with a Starfish, there is no head: the central nervous system is spread throughout the body. Indeed, if you cut off a limb, it will regrow. If you chop it in half…both will regrow, and then you’ll have two of them! You see the difference? Spiders have central authorities that call the shots. Starfish have spread out systems without a central authority. In other words, the difference between spiders and starfish is the difference between centralized and decentralized organizations. And it is by choosing to become spiders that churches are becoming increasingly irrelevant to the world. Falling advertisements and classified ads leads to mergers between newspapers to scrape together what ad revenue was left into one place. Increasing competition in the long-distance phone companies, long split apart by decentralization, have now began consolidating again. The US Government, after 9/11, centralized authority under the Department of Homeland Security. While it helps to make agencies work together, it makes them more bureaucratic as they now have to answer to just one person…and it’s not the President, an elected and (sometimes) accountable leader. When challenged, we tend to centralize power in the hands of fewer and fewer people. But what is the source of the crisis? In every case above, the reason for the increasingly centralized authority was because of a threat from a decentralized group. Classified ads fell due to the popularity of Craigslist, a free service where anyone can buy or sell anything, based on region. No need for you to pay $25 to put an ad in the paper, you can upload pictures and no-word-limits for free to Craigslist. Anyone can use the service without a central authority editing or filtering submissions. Long distance phone calls, even though cellular phones are the main culprits, are also being taken over by Skype users: internet-based phone calls that do not use “minutes.” No minutes being used by the phone = no revenue for telephone companies. After 9/11, the US Government went after bin Laden like they would Tony Soprano: take out the mafia don and the rest of the organized crime ring would crumble. But in cell systems like al-Qaeda, bin Laden doesn’t call the shots; they operate independently. Now, what about the Church? In what ways are we increasingly centralized to cope with the changing world? On a Conference level (for UMs), we are shrinking conference numbers and increasing their geographic size. As my friend Becca Clark laments, while there are great administrative advantages to centralization, the strained personal and professional relationships from boundaries and distance to travel. Indeed, given the larger swaths of authority, one of my pastor friends is in a clergy group with other denominations because they are closer together! On a local level, Churches form united parishes between different denominations to lower building and administration costs and provide a collective place for ministry. The merits of united or federated parishes can be debated, but it is along the same lines of spiderlike thinking: consolidate or perish. Like the above examples, we are becoming more spiderlike by shrinking authority and consolidating power in fewer and fewer people. Why? Churches are becoming more centralized because they are losing ground to decentralized forms of communication. What kind of communication? Churches used to be the social outlets and hubs; if you wanted to get to know people, you went to church! Nowadays, they are not so much part of the social fabric in an increasing number of communities. I’ve seen better opportunities for networking at Singles night at Whole Foods! Churches used to be the law of the land, the ruling authority. But years of increasingly shrill entries into public life have left even non-shrill churches in the shadows as people lump all of religion together. Communication improvements of “gossip” chains like Twitter, blogs, and web forums make it easier to leave religion at the corner. I write all of the above section not to lament and want it back…heavy-handed religion and good ol’ boys clubs are not my ideas of church! But we are still operating as spider churches and denominations in an increasingly decentralized world. In a sea of starfish, how can spider churches catch anything in their webs? Sorry friends, here’s the catch: This first post outlines the problem. The next three will outline ideas on how to deal with it. I figured the analysis alone would generate enough discussion. So to make sure we are on the same page, what do you think? Is the major problem confronting churches that we are increasingly centralizing our experience in a decentralized world? Are we really just doing great work, but people’s circles of interaction are so small that they leave the church out? Should the church even try to reclaim a centralized space again? (Constantinian church)? Finally, for those of you who do not have the book, Methoblogger Richard Heyduck has three posts on the basics of the book: check it out here. Thoughts on the above? Thanks for reading. You may also be interested in tihs analogy, that talks about the difference between viral and organic churches and has implications for any decentralized, swarmish entity (including churches and mission agencies).